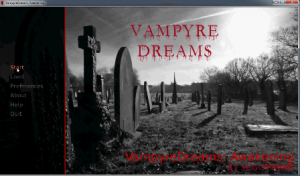 In Vampyre Dreams, you play the part of “Your name here” Renfield. A direct descendant of the character in Stoker’s Dracula. His parents were tragically killed in a car accident five years ago but they left him a massive house and plenty of money. Recently he’s been having some severely bad dreams and strange events seem to be pushing him towards something, but what? That is up to you to find out. Along the way he’ll be hindered/helped by a big cast of characters (mostly female) how you interact with them is up to you.